Last updated by Marcia Mayne at June 5, 2014 . I was doing research online a few days ago when I saw something that had me almost jump out of my seat: ackee is banned in the US. How could that be, I wondered. I saw several cans of ackee in the supermarket last weekend. Ackee, Jamaica’s national fruit, was banned in the US for 27 years until 2000 because of the toxin, Hypoglycin A, which can cause symptoms as mild as vomiting to severe as coma and death. When the US lifted the ban, only two of the island’s processing plants satisfied the FDA’s food safety requirements and could begin exporting the fruit to the lucrative US market. Exports to the UK and Canada, estimated then at $10 million annually, were expected to double within two or three years making ackee Jamaica’s largest agricultural export. According to the FDA’s newly released “guidance,” its district offices may detain, without physical examination, all ackee products offered for import. Ackee likely came to Jamaica with enslaved people from West Africa. It is here that Captain Bligh (yes, the infamous Bligh of the Bounty) was introduced to the fruit. He took the tree to Kew Gardens in 1793, where it was named Blighia sapida in his honor. Ackee grows three fruits to a pod. The fruit is yellow (like the color of scrambled eggs), has a hard, glossy black seed and a bright pink membrane. Both the seed and membrane are removed prior to cooking. There are two types of ackee, one that is firm (called cheese) and holds its shape after cooking and another that is softer (called butter) and will break apart if overcooked. 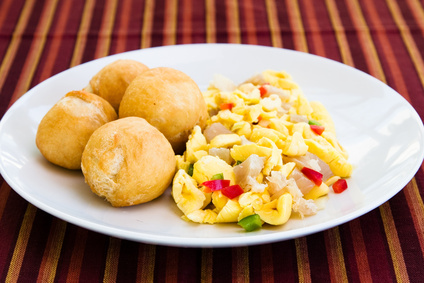 Although ackee is found in other Caribbean islands, it is more popular in Jamaica than anywhere else. Ours is the only country that grows, eats and exports ackee. Usually, it is paired with saltfish, onions, peppers, thyme, and tomatoes but it can also be curried. I’ve even seen a recipe for ackee cheesecake in Rosemary Parkinson’s, Nyam Jamaica. One local winemaker, who I met a couple years ago, is now producing ackee wine. It wasn’t bad either. And just last night, I had an appetizer of plantain chips and pureed ackee (dip). The trunk of the ackee tree is also useful. Hard and immune to termites, it is great for making furniture. The green fruits can produce soap, and the flowers can be used in cosmetics. According to the FDA, the guidance describes the agency’s current thinking and should be used as recommendation only. But it has created a ‘green list’ of companies that can export fruits to the US. This dish has won me friends and lovers each time I serve it. Every Jamaican I know either has an ackee tree out back or ackees in the freezer. And the ones “a foreign” have a can or two in the pantry and/or frozen ones they or someone brought back from Jamaica for them. Ackee is a very popular and versatile dish. Serve on toasted bread for a tasty bruschetta or ackee and saltfish sandwich. Add a little curry to sauteed onions and peppers then mix in ackee for delicious curried ackee (no saltfish needed). What’s ackee and saltfish, you ask? Well, it is Jamaica’s national dish. 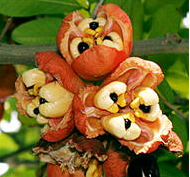 Ackee, a relative of the lychee, was brought to Jamaica from West Africa, probably on a slave ship. In 1962, it took pride of place next to the coat of arms, flag, lignum vitae, blue mahoe and humming bird as one of the symbols of the newly independent island nation. Note: Unripened ackees contain a toxic substance that is released when the pod is opened. If you’re using them, make sure they are completely opened, like these in this photo are. Remove the ackees from their pods, discard the pinkish-red membrane and seed. Wash and put them to boil in a large pot with saltfish that has been washed to remove traces of salt crystals. You can also cook the ackees separately in lightly salted water or use the water from the saltfish. Canned ackees are already pre-cooked so if you’re using those, all you’ll need to do is wash the salt off the saltfish then put in a pot with enough water to cover and boil, or soak overnight to remove the salt then boil. Drain. Flake with a fork or your fingers. Fry bacon strips, remove from saucepan. Saute onions in same oil until tender. Add strips of Scotch Bonnet pepper, chopped scallion (leave some for garnishing) and tomato. Then add flaked saltfish and stir. Add the ackees. Season with freshly ground black pepper and thyme. Stir carefully so as not to break the pods. Lower heat and let cook for about 5-7 minutes. Plate, garnish with chopped scallions and serve as an appetizer or main course with avocado wedges, bammie, fried plantains, boiled green bananas or Johnny Cakes. If you like what you see why not Share, Tweet, Digg, Like etc. You never know who you might be helping to make a difference.